These days are very busy for me, because 3 friends celebrates their birthday shortly after Christmas. Here is a really quick knit, which I have done using Rowan Fine Art (Wool: 45%, Mohair: 20%, Silk: 10%, Polyamide: 25%). 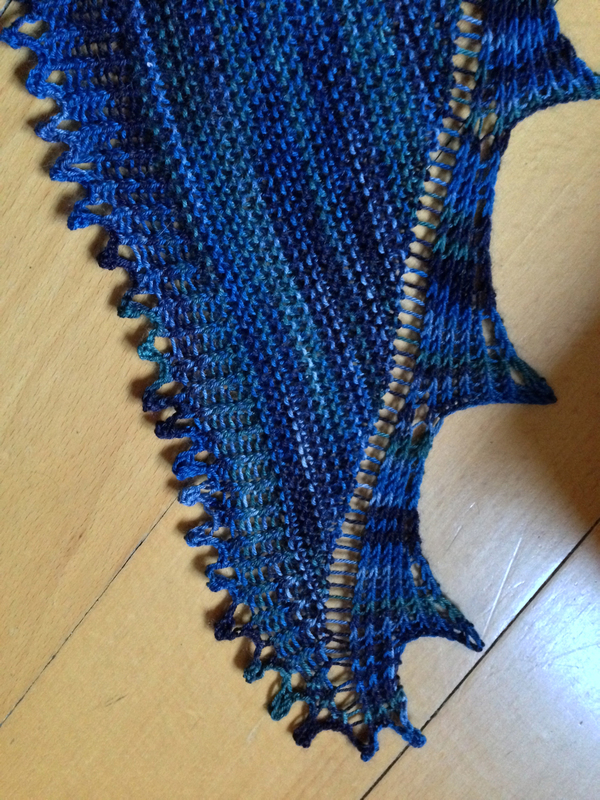 It is a design by Stephen West (Westknits), called Sharktooth, because of its edgings. 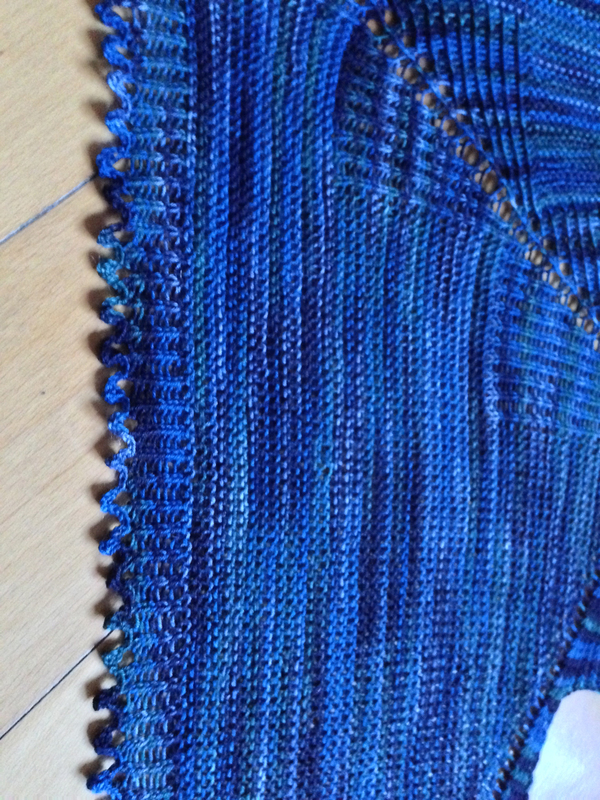 The main part of the shawl is knitted in garter stitch the increases in the center were used to form a “p2, ktbl” rib. Simple but stunning. I managed to knit the shawl in 1 day, cast it off and blocked it on the next day and to write this block on the third day. So it was really a quick knit. My Sharktooth is shown here in shade Kingfisher. The pattern is available for download on Ravelry. Wait. What? Did you say ONE DAY? You are my hero. I love this, what a great idea for this pretty yarn. Yes, I was able to knit this in one day, although I did the picot cast off on the second day. 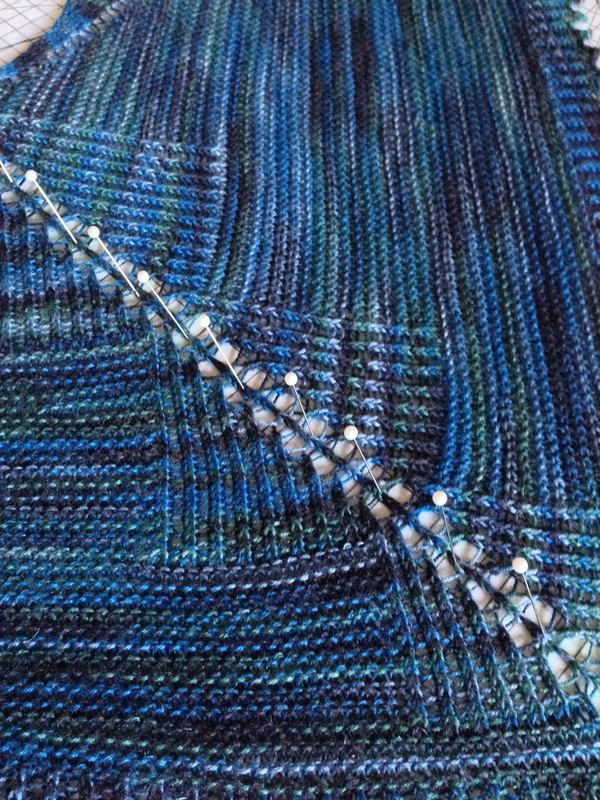 The garter stitch pattern is fast to knit. And it is only about 127 cm to 43 cm after blocking. So. Konrad, you are supposed to sleep every once in a while :). Great design for this yarn….you are a great friend! Thank you so much Anne. I will sleep much better the next nights, cause I have knit my present. Konrad, you are great. Knitted in one day! I started a Bactus, thought it would be a quik knit. It is half done. At the moment I prefer reading instead of knitting. Hope that the Bactus will be finished one day. Thank you so much Annegret. Amazing job, Konrad – that blue is my favorite. And Stephen West shawls are my favorite, too. Maybe I’ll knit a Sharktooth using my skein of green Fine Art. 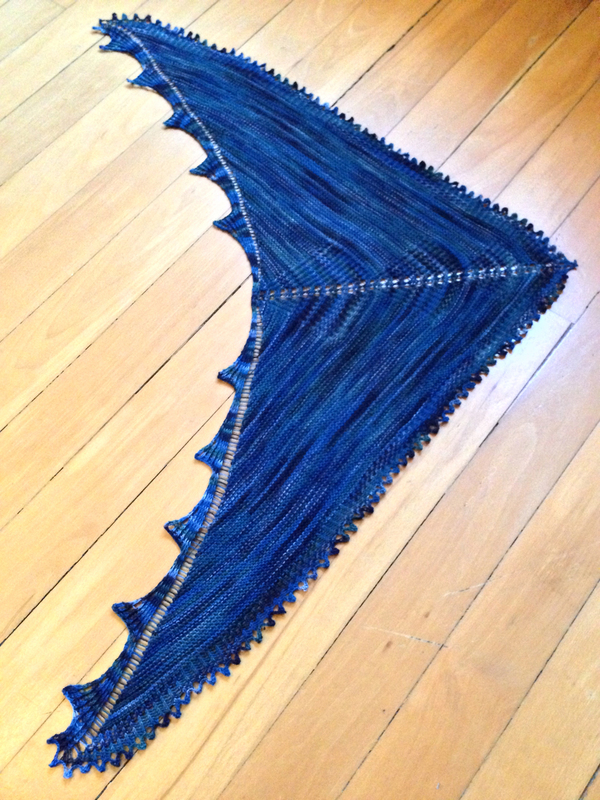 Your shawl looks so cool – and knit in a day! Bravo!